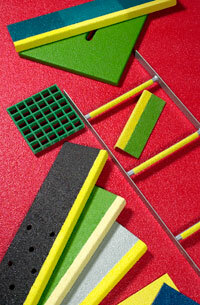 Magglo Composite Mouldings produces its own range of anti-slip products. There is a wide range of colours and grit sizes to choose from. As standard Magglo produces rigid flat sheet, nominally 5mm thick, flexible flat sheet, nominally 2mm thick, stair tread covers, landing profiles and ladder rung covers. In addition Magglo can produce bespoke profiles and has produced special profiles for fitting to the bulwarks of ships and boats. 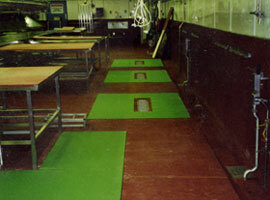 All Anti-slip flooring products are made to order in the sizes specified by the customer. 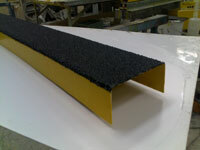 We usually manufacture the anti-slip product in one of our standard colours, Red, Black, Green, Yellow or Blue. However, should you require anti-slip products in a specific colour we can usually obtain the correct pigment from our suppliers. The anti-slip product that Magglo Composite Mouldings now manufactures is the result of over 12 years development by our technical experts in composite engineering. All Magglo's anti-slip products are hand-made and hand-finished by craftsmen. All products are thoroughly inspected for quality before leaving the factory. This process ensures the production of a high quality, durable product. 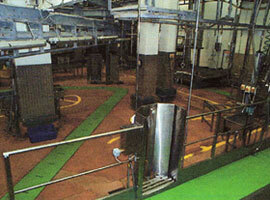 Provides a long term solution to slip problems. Can be manufactured to be fire retardant & chemical resistant, different colours and thicknesses.